Following six unconvincing trading sessions, the bulls finally buckled, allowing the bears to run amok as across the global major stock indices suffered their worst day since early July. September is historically the worst month for the stock market although volatility does not tend to kick in until after Labor Day when the big beasts return to their desk to unravel what their underlings have done during the summer!! So far this morning the FTSE, CAC and DAX have all opened up on the back foot once again, with the FTSE 100 the strongest of this set. The volatility is unlikely to subside today with the number of top tier economic announcements due today. The highlights include US ADP Non Farm Employment change at 12.15 GMT, which often acts as warm up to Friday’s Non Farm Payroll figures. Following this we have the release of the FOMC meeting minutes at 18.00 GMT. Risk taking was off the table yesterday with the pound, euro and Australian dollar falling heavily against the yen and dollar. So far this morning there is a slight bias towards risk aversion with the GBP/JPY one of the biggest fallers on the day. 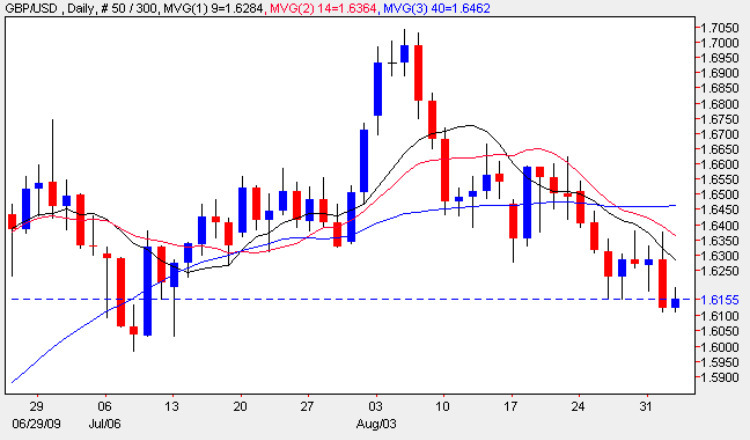 However, with ADP payroll figures due out around midday, forex markets are unlikely to stay quiet for so long. Given the jitters shown yesterday, if ADP numbers come out much worse than expected, there could be an exaggerated reaction to the down side. The best pair to play this could be the GBP/USD using a One Touch trade with the trigger set to 1.6000.